As the Developer of Droid Explorer, I would suggest that this is more suitable as a bug report, which actually already exists. Although, there is probably a workaround that you could do. I have seen that this usually happens when there is a version of the SDK that was pre-release or something along those lines. The error happens when it tries to verify the SDK version. The folder names are used as the version, and when there is a letter in the version name, droid explorer does not like that. Check the android-sdk/build-tools directory and see if there are any folders that have A-Z in them. If one does, that is the problem. For example, I have seen situations where there will be a folder called "android-4.4W". I would suggest deleting that folder, open the SDK Update Tool and download the versions of the build tools that you want/need. Not the answer you're looking for? 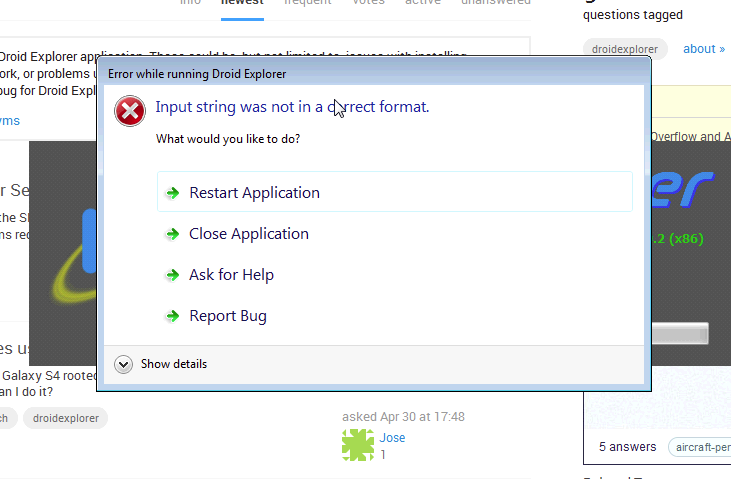 Browse other questions tagged applications droid-explorer or ask your own question.